I told you I’m gluten sensitive! Did you or one of your family members ever say that? By now we all know gluten is a more common irritant/allergen than most people think. Some people’s intestines think gluten is evil and cause Montezuma’s revenge or worse. This is awful to know because if you live or visit America finding gluten-free food can be depressing while you sit there watch others eat cakes and cookies. Well, not so fast I say. You can still enjoy yourself worry free in places like Buddha Bodai in Chinatown. Buddha Bodai is a kosher, vegetarian Chinese restaurant on Mott Street. Come here if you are kosher, vegetarian, gluten-free, or all of the above. If you are neither, you may still like it. This is the only place in Chinatown where you may share a table with a(nother) Chinese grandma, Hasidic Jew, Buddhist monk or a European tourist (An avid EWZ reader). This is the kind of place you slowly fall in love with. 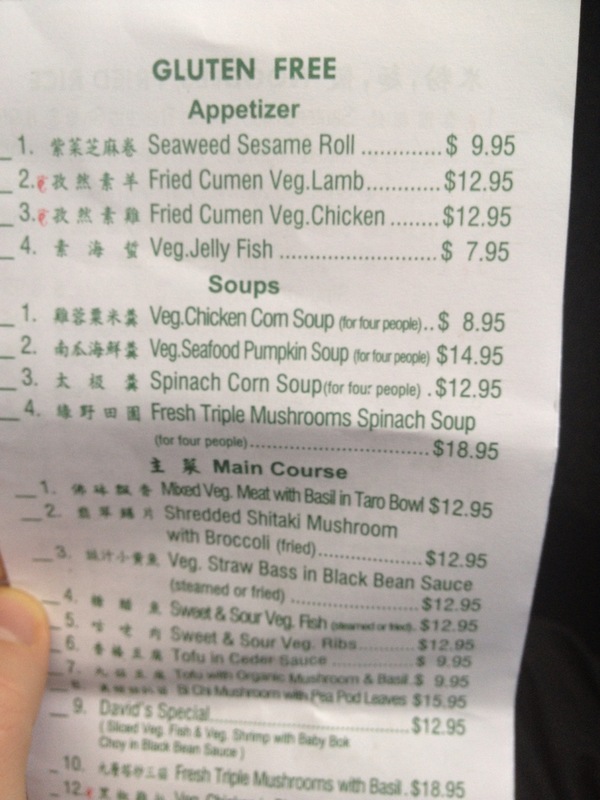 Unfortunately, the menu is heavy on the faux meat dishes. I personally never go for the mock meat because its just does not taste the same as the real thing, but I do enjoy veggie dishes here. I ordered $10 worth of various dumplings. There are some nice looking lunch special dishes, not all are gluten-free but still the largest GF selection in Chinatown. There are no carts going down the aisle as you would expect in other places in the neighborhood. There’s a sign upfront that this is a kosher place so that means no outside food or drink. So don’t bring in the pork rinds. First up, two kind mushroom Congee. Then bamboo pith dumplings and steamed watercress dumplings. This was my first time ever eating Congee. While the name and texture (similar to oatmeal) are not appealing, the taste is simply delicious. Mushrooms, some veggies and ginger – delicious! 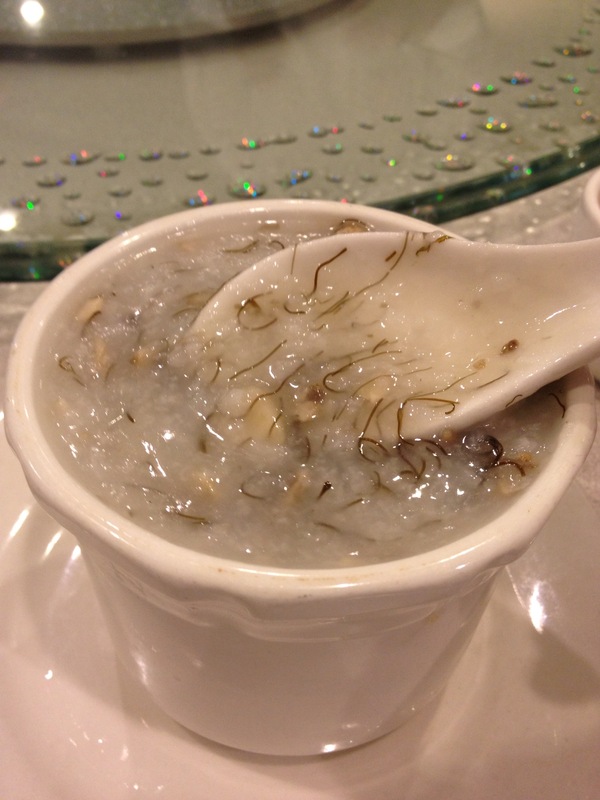 A Congee is simply a rice porridge with a different name in every country in Asia. Many Asians, non-Asians, and now hummus whisperers consume Congee during the day. 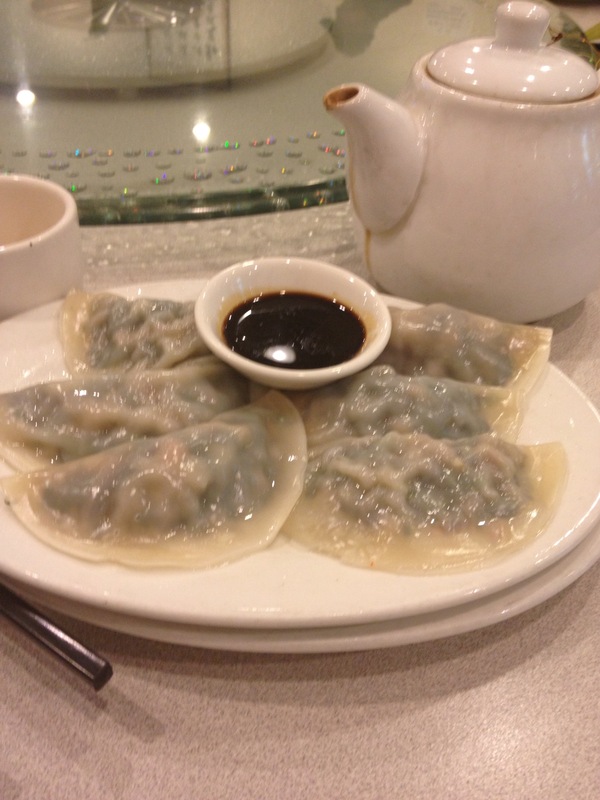 Bamboo pith dumplings – more awesomeness. Bottom line is, there may be some better tasting options around Chinatown, but if you make it to Buddha Bodai you will not be disappointed and will be happy you ate healthy, gluten-free food.